The Italian Air Force is now certified to refuel a U.S. fighter jet, a first for any international Air Force. Extensive testing at Edwards Air Force Base, California focused on maneuvering the Italian Boeing KC-767 boom into an F-35. The tests were conducted at various speeds and heights over a 30-day period, ranging from a handful to dozens of contacts in a single day. 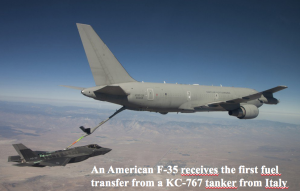 The Italian Tanker program includes a 45-person Boeing workforce at the Pratica di Mare Air Base just outside of Rome. Boeing’s key Global Services and Support strategies include global reach, local presence and uncompromising service as the cornerstone of the Italian Tanker program.